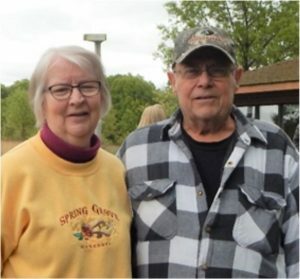 Tom Plunket, long-time Sunday volunteer, passed away October 15, 2018, after he had bravely fought cancer and other illnesses all last year, and before. Thank you to those who visited him and, also, those who came to his memorial service. I know he and Ellen greatly appreciated the visits, and Ellen was touched by those who came to the service. Tom loved to fish – it was poignant to see that he had chosen a large “fishing bobber” for his ashes to be put in! Many SBBO volunteers probably don’t know that Tom was our “coffee guy.” Whenever we ran out, he was the one who paid for more coffee – next time you drink a cup at the banding station, remember Tom! He also had a friend who grew asparagus and supplied those of us who love asparagus with a ready, fresh supply! At BirdFest, Tom sat with Lynda at the admissions table and was the first friendly face that visitors encountered. Also, his wife, Ellen, helped in the gift shop during Birdfest – bigtime! Thanks go out to both for generous and faithful service to SBBO!